Really a wonderful book for all!! From Heather C. of sprin city, Tennessee on 1/29/2019 . This is such an uplifting and beautiful story from the beginning to end. All of my 7 children loved it, even my oldest!! Highly recommend this for everyone!!! From Anonymous of Hastings, Minnesota on 1/22/2019 . So Good! It is very hard to put it down! I thought I had the plot completely figured out about a third of the way through, and boy was a I wrong! I highly compliment the author on entwining so many characters so neatly into one brillent, rather bewildering, plot. I’ve always liked E.D.E.N. 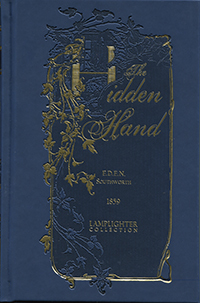 Southworth’s writings and the “Hidden Hand” did not let my espectations for a nice mystery down. I admired Capitola’s strength of self-control but was a little wared down by the constant outburst of her “uncle” and some of her rather obstinate ways. All-in-all I enjoyed myself emencely and recommend it to you who want a good mystery/story to read! Captivating, Edge of Your Seat Drama! From Melonie Luck of Morehouse, New York on 10/29/2018 . My only regret with this book was that I didn't have the 3 days, as did Mark Hamby, to sit down and just soak it up, as he mentions in the preface. I loved it! It has taken me a bit longer to get through it only because of LIFE getting in the way... Ha-ha! The author has done a superb job of introducing us to his characters and causing them to be endeared to our hearts. There are chapters where I was holding my breath and I just couldn't put it down, though it was late at night! Definitely worth your time to read! I would echo what other reviewers have said about watching the age appropriateness as it can be very intense! I love the way footnotes are used to define some words that are unfamiliar, but I'm so glad Lamplighter has kept them in! We could use some more vocabulary in our society. Another terrific Lamplighter book that I'm Highly Recommending! I got this book this spring and thoroughly enjoyed it. I kept telling my sisters about it and as soon as I finished I passed it on to them. My sister (who does not like to read) read it over the summer and now our younger sister has it. We all say it is one of our favorite books.